Immunogen: Recombinant His6-tagged human dynamin. 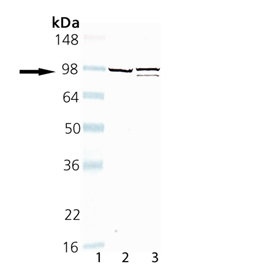 Application Notes: Detects a band of ~100kDa by Western blot. Scientific Background: Dynamin is a 100 kDa GTP binding protein that was first identified as a protein able to bind microtubules. To date, three genes have been found to encode Dynamin isoforms. Dynamin 1 is neuronal specific, Dynamin 2 is ubiquitously expressed and Dynamin 3 localizes to testis, brain and lung. Dynamin may mediate vesicle formation by assembling into a ring structure around the necks of invaginated coated pits that may eventually lead to the closure of the neck and formation of vesicles.